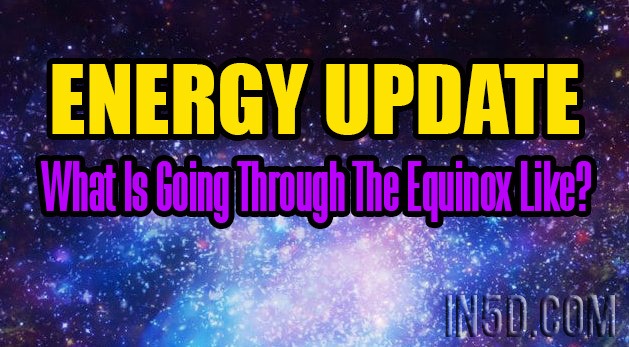 ENERGY UPDATE – What Is Going Through The Equinox Like? Feeling out of our bodies but not like being detached – can be felt differently for each of us…a bit ‘floaty’, yet differently in the physical. Imagine/see like a horizon line, above the line is our Spirit/Astral form…and below is the Human – the energies, vibrations and frequencies are different as often we are in different dimensions with both. So it is not only balancing the feminine and masculine and general balance in all things, it is also balance of the ‘above and below’ (spirit and human) as well – yet within this is the difference in the frequencies and vibrations of the above and below as well. We have reached a new ‘platform’ and we are still adjusting to this. Gaia is adjusting in her new resonance and as part of Gaia, we need to GROUND PROTECT and BALANCE over and over during this. Many physical pains are being felt as this ‘upgrade’ is being felt in our physical body as well, as this too is being upgraded/healed. I am adjusting and tuning into this more and more and am bringing this interim post through, while going through this myself to allow those that are ready to relate and feel into what this is for them. I will leave this with each of you how this resonates for where you are at. I will share more soon until then, the very strong message from spirit is to GROUND and then PROTECT and then BALANCE in that ‘order’.